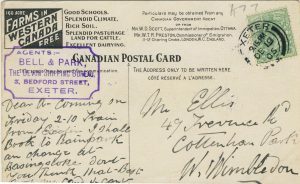 In a post from July 2016 concerning “Government Agent” cards, I had noted that, thanks to the efforts of TPC members Wayne Curtis and Philip Francis, we knew of a total of 35 Government Agent postcards. 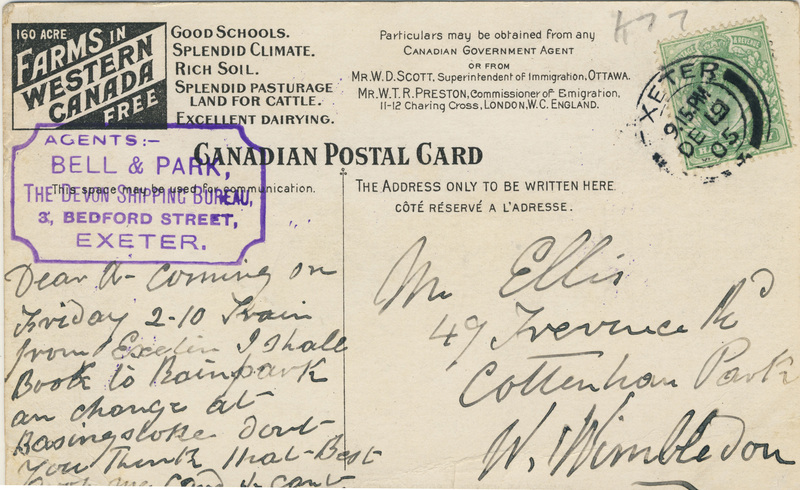 To back up a bit, “Government Agent” cards are the western settlement promotional postcards, aimed primarily at English farmers, that sported the distinctive back design depicted below. 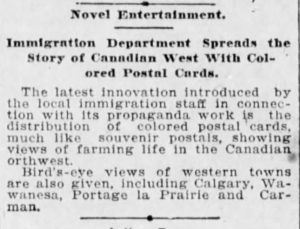 In that July post, I referred to a short note in the Winnipeg Tribune for July 24, 1905 (also below) that was quite clearly referring to the publication of the postcards. 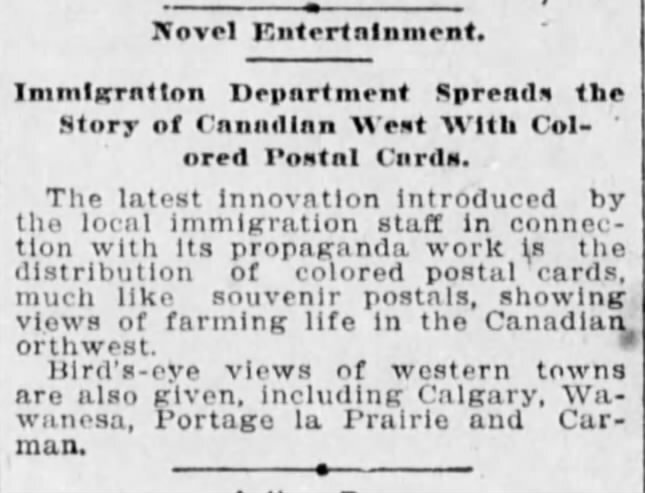 The Tribune happened to describe the images on four of the cards, three of which are on Wayne and Philip’s lists, but the fourth of which — a Calgary bird’s-eye view — didn’t seem to be. 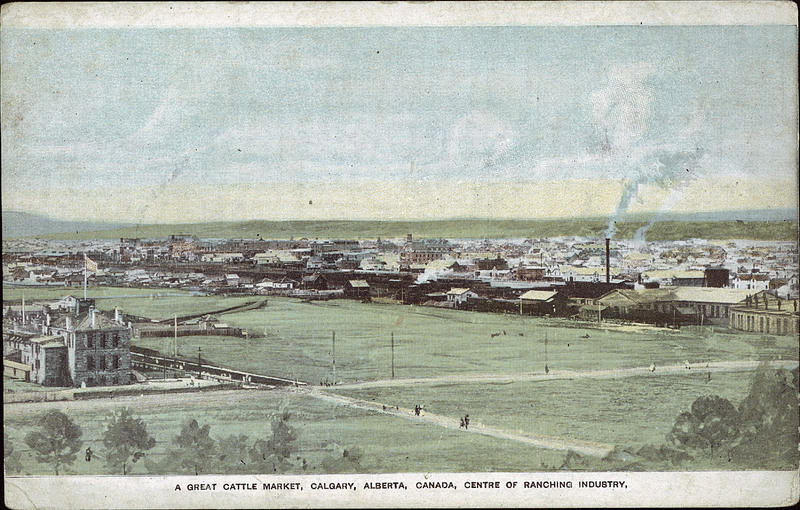 Well, in researching the publisher history of the Calgary-based H. Enida Olive Co., what should turn up among the images I found but a card (not by H. Enida Olive) entitled “A Great Cattle Market, Calgary, Alberta, Canada, Centre of Ranching Industry“, number 6058 in the Images section of the University of Alberta’s Peel Prairie Provinces Collection. That is clearly the card in question. However, rather than being a new, 36th card, it turns out to be one from Wayne and Philip’s list. The title of the card, which I hadn’t seen until now, just didn’t suggest that the view was a bird’s eye. So we’re still stuck at 35 cards! Error: Error validating access token: Session has expired on Friday, 12-Apr-19 20:21:58 PDT. The current time is Friday, 19-Apr-19 21:16:10 PDT.